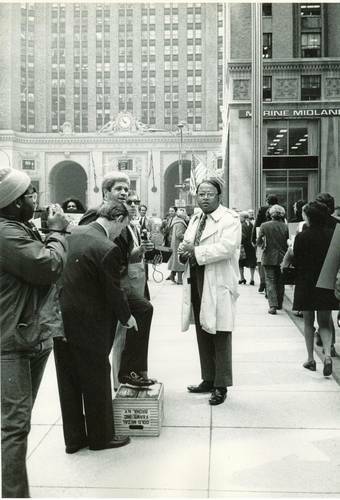 Representative Charles Diggs (center, with glasses) and American Committee on Africa President William H. Booth protesting Union Carbide's importation of chrome from Rhodesia outside the company's annual meeting on April 18, 1972. The demonstration was sponsored by the American Committee on Africa (ACOA) and the Inter-Religious Foundation for Community Organizations (IFCO). George Houser, Executive Director of ACOA, is pointing at the box that Booth is preparing to stand on. The United Nations Security Council had adopted mandatory trade sanctions against Rhodesia in 1966 in response to the Rhodesian white minority government’s unilateral declaration of independence from Britain rather that following British demands that the colony move toward eventual majority rule. In 1971, the U.S. Congress had passed the Byrd Amendment to the Military Procurement Act of 1971 which allowed importing of chrome and other strategic minerals despite the U.N. sanctions. Used by permission of Beryl Goldberg.